Elīna presents a beautiful selection of spiritual music dedicated to the eternal search and longing for inner peace. It’s perhaps one of her most personal albums ever which connects the listener with Elīna’s Latvian roots. The album includes a couple of real discoveries like Prauliņš’ Dievaines, but also some hit repertoire like the Cantique de Noel d'Adam. This is probably her most commercial album to date; the careful selected variety of the repertoire will attract a lot of new fans. Latvian choirs are extremely famous worldwide, so it was natural for her to want a Latvian choir with her for this recording. Two Latvian composers have been involved in the music for this recording – Uģis Prauliņš for his work Dievaines, and Eriks Esenvalds who has written an a cappella arrangement (Allegri Miserere) especially for this recording. 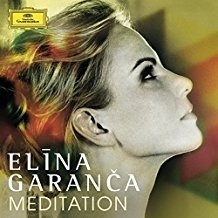 Elīna is joined on this recording by her husband, the well-known Gibraltan conductor Karel Mark Chichon OBE. This is their second collaboration on disc for DG following the success of Habanera.